Have you ever asked which Hydraulic Oil I need for my Tractor, Excavator, Digger or Crane etc? Well, for most lubricated machines, there are a few options when it comes to choosing the lubricants you require. Just because a Tractor or Excavator etc will run with a particular product doesn’t mean that product is optimum for the application often the incorrect Hydraulic oil or lubricant won’t lead to sudden and catastrophic failure, rather and more often this shortens the average life of the lubricated components and, but, goes unnoticed. With hydraulics, there are two primary considerations – the viscosity grade and the hydraulic oil type anti-wear (AW), rust and oxidation inhibitors (RO). These specifications are typically determined by the type of hydraulic pump employed in the system, the operating temperature and the system as well as the operating pressure. Selecting the best product for your system requires that you collect and use all available information. You can always give us a call or text on 07976 790 761 and we will suggest the best Hydraulic oil from our Data base. Hydraulic Oil has many roles, these roles range from transferring heat as well as transferring power and a lubrication medium. The chemical makeup of a hydraulic oil can also take many forms when selecting it for specific applications. It can range from full synthetic (to handle drastic temperature and pressure swings) to water-based fluids (used in applications where there is a risk of fire). Our Hydraulic premium quality oil and lubricants are blended precisely to provide excellent fluid stability, lubricity and other performance-enhancing characteristics. These Hydraulic fluids are great choices there high or low temperatures are present and/or high pressures are required. Our Hydraulic Oils are blended from refining base oils to a desired level to achieve better lubricant performance with the inclusion of additives, which range from anti-wear (AW), rust and oxidation inhibitors (RO) and we also have the added advantage of improved viscosity index (VI) improves performance. 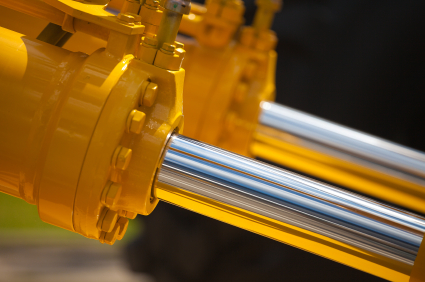 There are dozens of additives available for use when blending hydraulic oils. Some anti-foam additives, for example, may prevent the buildup of foam on the oil’s surface, but at the same time may actually retard the release of air trapped in the bulk oil. As a result, the mixing of hydraulic oils with different anti‑foam agents may actually increase the foaming of the oil. There are three major design types of pumps used in hydraulic systems: vane, piston and gear (internal and external), and each of these pump designs are deployed for certain performance tasks and operations. Each pump type must be treated on a case-by-case basis for lubricant selection. Vane: The design of a vane pump is exactly what its name depicts. Inside the pump, there are rotors with slots mounted to a shaft that is spinning eccentrically to a cam ring. As the rotors and vanes spin within the ring, the vanes can become worn due to the internal contact between the two contacting surfaces. Piston: Piston pumps are your typical middle-of-the-road hydraulic pump, and are more durable in design and operation than a vane pumps. Gear: Gear pumps are typically the most inefficient of the three pump types, but are more agreeable with larger amounts of contamination. Gear pumps operate by pressurising the fluid between the trapped air volume of the meshing teeth of a gear set and the inside wall of the gear housing, then expelling that fluid. Make sure all of the time spent selecting the proper viscosity, additives, etc., was not wasted by simply ignoring the application’s requirements and operating conditions. Ignoring checks will most often still lead to failures down the road. They may not be as rapid as selecting the wrong viscosity, but they will eventually happen, therefore, application and operating factors should be taken seriously. Our Hydraulic oils are based upon the equipment manufacturer’s specifications. Keeping in mind the temperature range in which the equipment is to be operated. Our Hydraulic oil analysis is laboratory tested. Midlands Lubricants top-quality hydraulic oils and lubricants should meet the following requirements.